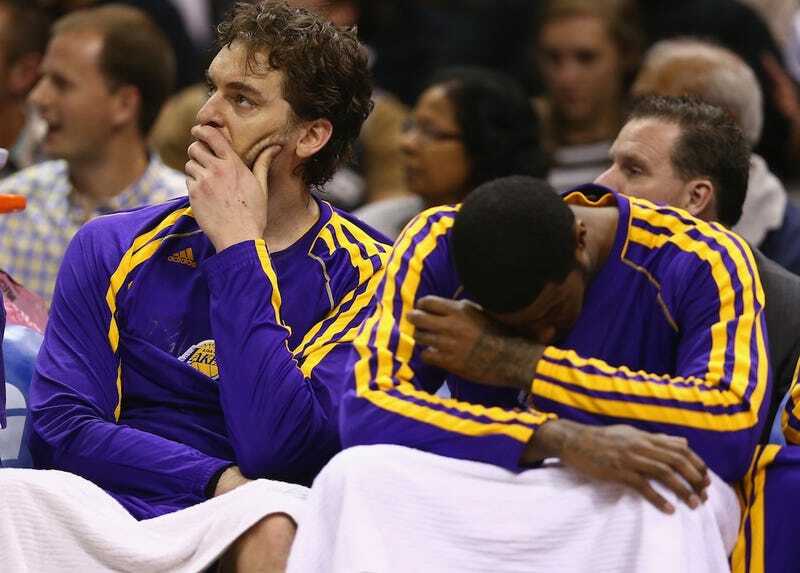 The Lakers lost, 102-91, to fall down 0-2 in their matchup with San Antonio. The game was unremarkable: the lead was eight at the half, 10 after the third; the Spurs were their usual, relentless, efficient selves. The Lakers were directionless, and with two more possibly significant injures, it might be time to invoke a series mercy rule. The most telling part of the Lakers' scoresheet is the sheer size of it. Eleven players saw the court, an ominous sign in a game that was never out of reach, for a team that's going to lose every game that comes down to depth. This is the risk of putting together a veteran team—it's an old team. With Kobe Bryant out, the offense has to run through Steve Nash, and Nash is hurting. After playing in Game 1, his first full-speed action in a month, Nash was "sore." He had "discomfort." He'd have to "fight through some pain." He did, and he looked like a shadow of himself last night. He was slower, every cut looked like a chore. It's tough to move when your hip and hamstring and back hurt with every movement. He'll receive another epidural to mask the pain before Game 3. “He’s not even close to 100 percent,” coach Mike D’Antoni said of Nash. “He wants to play. He wants to battle through it. He’s giving it all he’s got. Right now he’s the best option we’ve got." He might be the only guard left standing. Jodie Meeks tested his ankle, sprained in Game 1, in pregame warmups, but quickly realized he wasn't able to go. He'll have an MRI done. Steve Blake injured his hamstring in the fourth quarter, and had to be helped off the court by his teammates. He'll get an ultrasound exam. After their top three guards, it's slim pickings. Darius Morris played 23 minutes last night, and should get the bulk of the work. Andrew Goudelock, who spent most of the year in the D-League, is next up. And then there's Chris Duhon, at which point a forfeit might be more respectable. "You almost can't even be surprised anymore," Blake said of the Lakers' extensive injury list this season. "It's been that kind of year." The series shifts back to Los Angeles, which means a certain injured superstar will be in the house. But Kobe Bryant won't even be on the bench in street clothes. He needs to keep his surgically repaired Achilles tendon elevated. He'll watch the game from the locker room.